Chocolate with a hint of mint is a tasty way to build lean muscle. With real plant protein, chia, and flax seeds to keep you going strong, Probar Base Protein Bar Mint Chocolate will get you to the next level. 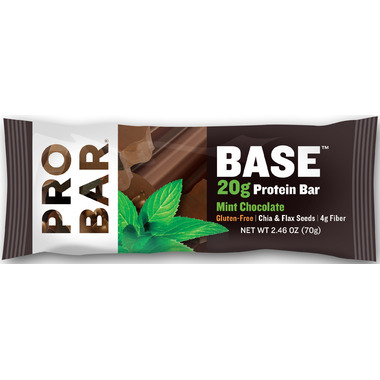 Probar Base Protein Bar Mint Chocolate helps increase muscle definition and supports lean muscle and recovery. Ingredients: Soy protein isolate, organic tapioca syrup, organic agave syrup, organic dried cane syrup, modified palm kernel oil, glycerine, organic agave inulin, unsweetened chocolate, cocoa, omega blend (flaxseed, chia seed), natural flavour,high olei safflower oil, organic soy protein isolate, tapioca starch, salt, soylecithin, gum arabic, rosemary extract, tocopherols, citric acid, ascorbic acid. Contains: soybean. Produced on equipment that also processes peanuts, tree nuts, milk, egg, wheat, oats, barley, sesame, mustard.